If you live in a four-season climate, it seems like summer will soon be winding down, but in actuality there are still several weeks of warm weather to come and lots of fun, new colorful blooms to look forward to! A great way to extend garden color later into summer is to plant late-blooming varieties. Flowering shrubs are always a good choice since they are low maintenance and often provide a variety of foliage and flower color as they progress though spring, summer and fall. 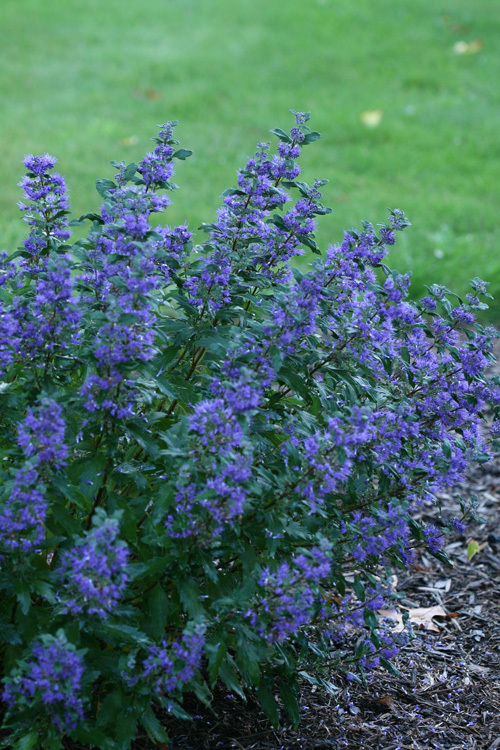 A classic variety that produces beautiful blue blooms in late summer and early fall is Caryopteris. Super easy to care for, deer-resistant and compact, it's a perfect addition to sunny perennial beds. Also known as bluebeard, you can find varieties with differing foliage colors, but all have a brilliant blue, late summer flower display that covers each stem of the plant, attracting pollinators from miles away. Proven Winners® ColorChoice® Beyond Midnight® Caryopteris is a garden standout with very dark green, glossy foliage and deep blue flowers. 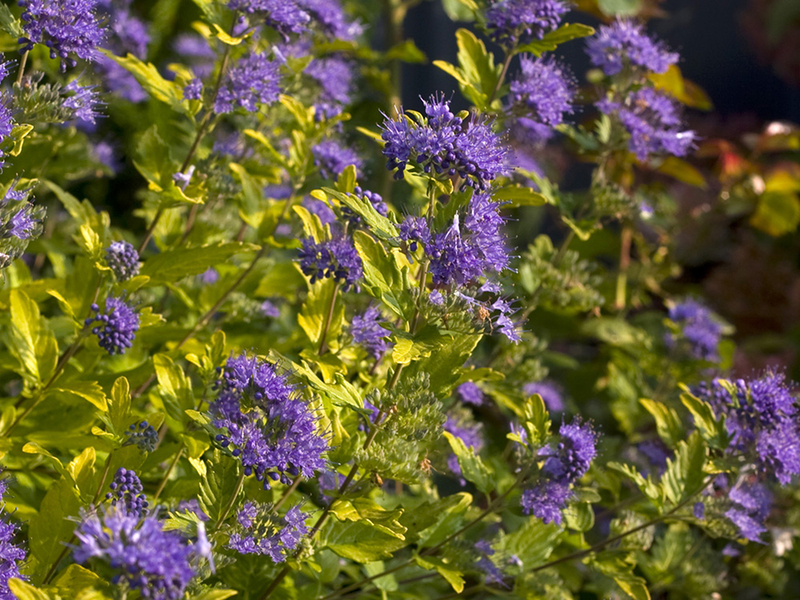 Sunshine Blue® II Caryopteris is a perfect choice for those who love the contrast of lighter foliage in their garden beds; with vivid gold foliage and blue blooms it's a late-blooming favorite. Caryopteris is a nice companion for yellow-hued late bloomers like Rudbeckia and Heliopsis. They'll also blend well with the softer colors of Pugster® Pink or White Buddleia. Fun fact: Caryopteris is also commonly called blue mist spirea, despite the fact that it is not remotely related to Spiraea. Though Caryopteris will tolerate colder conditions (to USDA Plant Hardiness Zone 5), they will do best if you avoid planting them in spots where the soil is cold or wet in late winter to early spring. Late season planting should be avoided in the coldest parts of its hardiness range. Old growth can be cut back hard in spring after the new growth emerges. Drought-tolerant bluebeard likes to keep its feet dry, so make sure it's planted in a thoroughly well-drained area. Planting in full sun will help maintain a full, dense habit with plenty of flowers. 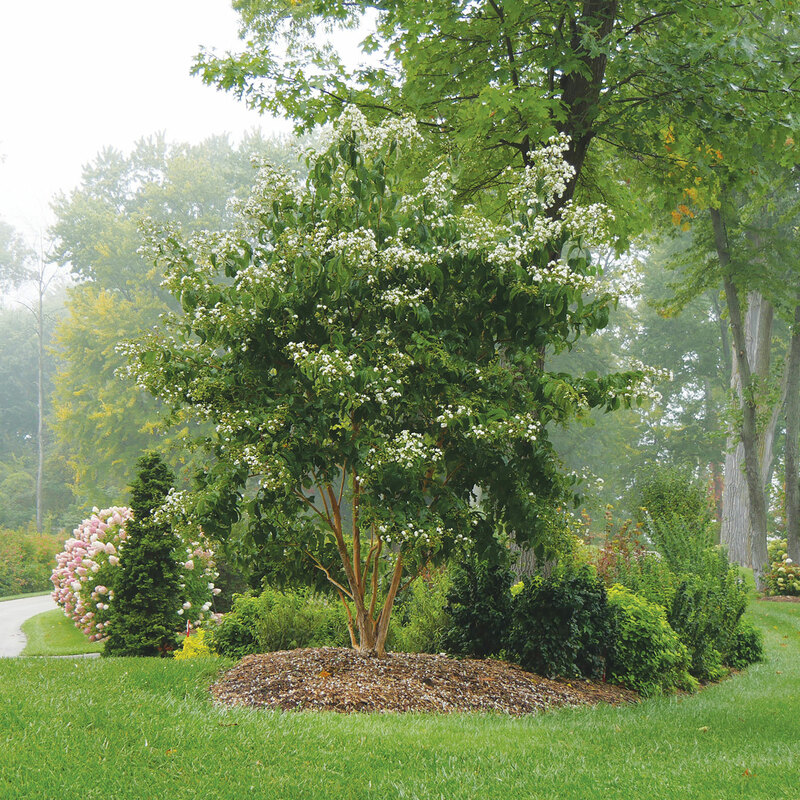 If you're looking for more of a statement piece for your lawn or landscape, Proven Winners® Color Choice® will soon be introducing the spectacular Temple of Bloom® Heptacodium. Also called seven-son flower, it's beautiful, easy to grow, and simply can't be matched for year-round beauty. In spring, the handsome leaves with dramatically deep veins emerge, and as the season progresses the leaves grow larger and develop a long, twisting tip. Come August, when everything else is winding down, Temple of Bloom® seven-son flower becomes covered in big clusters of fragrant white flowers, attracting hummingbirds and other pollinators from near and far. Blooms last for weeks before gracefully falling to the ground to reveal vivid red, fan-like bracts, which make it look like the plant is blooming again in a completely different color. As winter comes and the leaves drop, the plant's elegant frame is revealed, along with amazing light tan peeling bark. 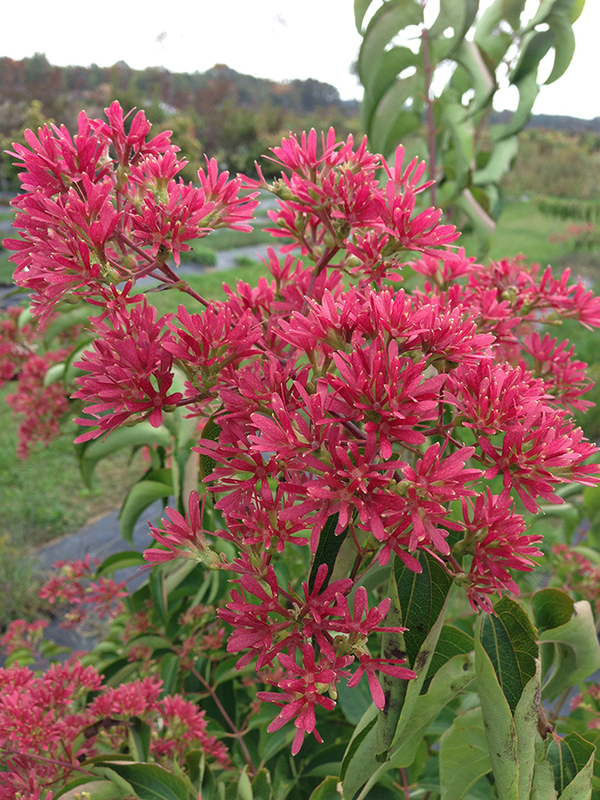 Heptacodium is a strong growing plant with few insect or disease problems, and while it is easy to grow, pruning is necessary to create a neat, full-bodied plant. Adaptable to almost any soil type, Heptacodium will provide the best flower display when planted in full sun, but it can also be effectively used in partial shade situations. Reaching heights of 6-10' tall, this is a very versatile plant that can be grown as either a large shrub or as a small tree, depending how you prune it and train it. Seven-son flower makes an excellent patio or specimen tree near or around a house, or as impressive mass plantings on larger sites. Whether your landscaping and garden needs call for large, spectacular specimens or compact color, shrubs are a great addition for easy care, late summer blooms.